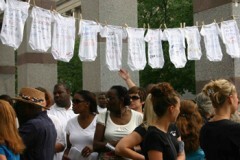 North Carolina:	Hundreds Join 'State of Emergency' Rally Against Budget Cuts | Fight Back! Workers and community members pack the General Assembly in protest of the budget cuts. 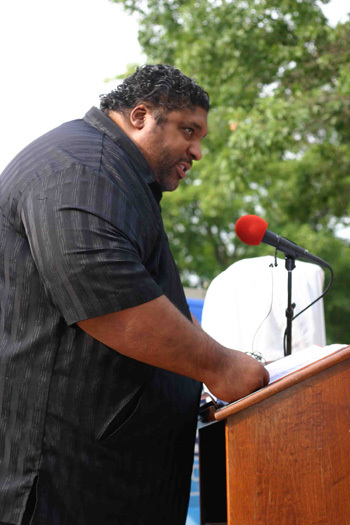 Reverend Barber, president of NC NAACP, addresses the rally. That sentiment is what brought an important mobilization of over 160 community, labor, faith, and political organizations to the state capital on June 15. 300 workers and community members gathered after work to rally on Jones Street before marching into the North Carolina General Assembly to talk to legislators about the budget cuts. The rally was organized by Together NC and the Historic Thousands on Jones St (HKonJ) Network, two coalitions that are uniting a broad spectrum of organizations, communities and social classes to oppose the budget cuts that will impact workers and oppressed nationalities. North Carolina currently faces a $4.6 billion budget shortfall. Instead of taxing corporations and the wealthy to raise additional revenue, the House is cutting funding from social services and laying off workers. 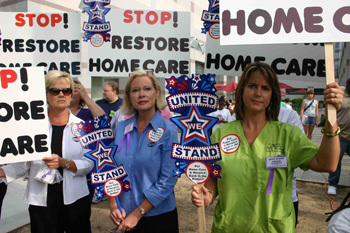 Public sector workers face layoffs, pay cuts and furloughs. Insurance premiums are going up and some workers are losing their 401k and pension contributions. In addition, the university system’s budget is being cut by 11%. 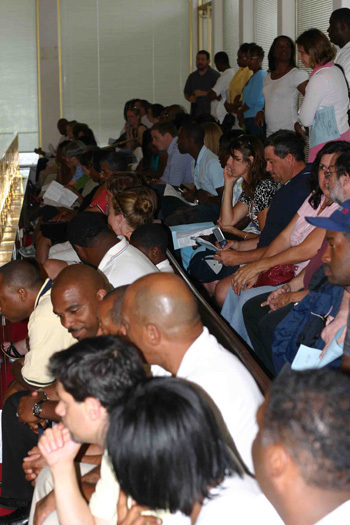 The Department of Health and Human Services is slated for 465 layoffs under the current budget. In the coming weeks, organizers with Together NC and HKonJ will be holding town hall meetings around the state and engaging in communities to gather input on the budget process. Organizers are excited with the turnout and enthusiasm among the participants of June 15’s rally and will continue to struggle for a budget - and a budget process - that serves the majority of North Carolina’s people, not the wealthy and the corporations.